I don't usually plan ahead when it comes to dinner. But I did this time. I made a biga before leaving for work Friday and just before bed Friday night I mixed up a batch of pizza dough and it went into the fridge for a overnight/all day rise. Moe took the dough out of the fridge about 3:00 PM on Saturday so that it would have time to come to room temperature before I got home. Made two pizzas one with just pepperoni and the other with pepperoni and mushrooms. 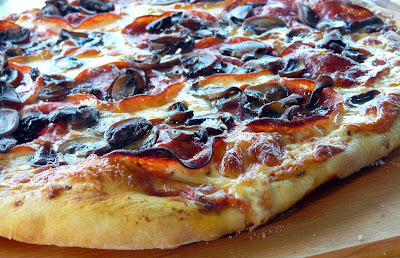 and the look of your beautiful pizza is making me very hungry! Gosh, does that every look GOOD! !